1901 Photograph in Streets of Odessa. In the early days of Odessa, there was a group of cowboys and other individuals that liked to load blanks in their pistols and put on sham battles for fun. This appears to be one of those days when some of this was going on. Many times strangers would happen by and observe some of the acts and not knowning about the local playboys; they would take it serious and tell tales when they arrived back home, away from Odessa. It gave the area a reputation that really it didn't deserve. 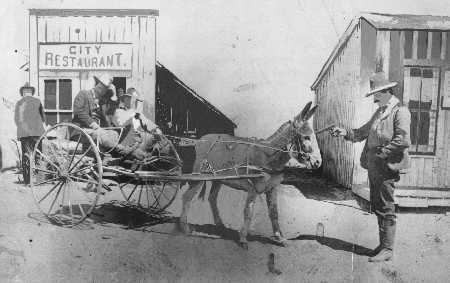 The cafe in the back ground, City Cafe was operating in 1901. If Fosters cafe was the first cafe; is it possible they called it City Cafe? Ector County Library, Southwest History.